The blaze is burning at a home located along the 2100 block of Chisin Street, fire officials said. 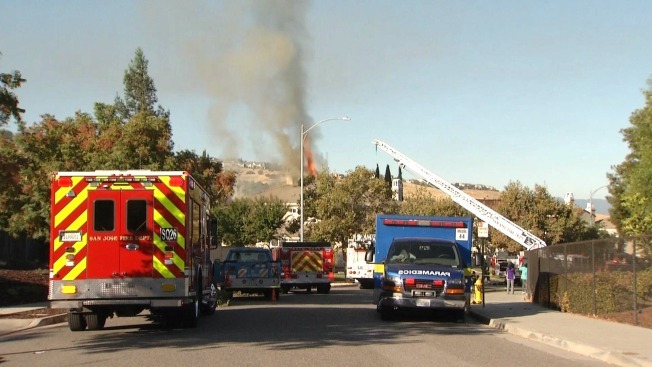 Fire crews are battling a two-alarm house fire in San Jose's Evergreen neighborhood Tuesday morning, according to fire officials. Flames could be seen shooting out of the home's roof while firefighters doused the blaze with water. No injuries have been reported, but San Jose Fire Department Cap. Brad Cloutier said the home will "probably" be a total loss. "Pretty much the inside of this house is going to be gutted," he said. Firefighters tried to extinguish the blaze from the inside, but the strength of the fire and concerns about the structure's stability forced fire crews to retreat, according to Cloutier.